SAN JOSE – Milwaukee Brewers outfielder Nyjer Morgan traded his baseball bat for a hockey stick and had his "dream come true" Wednesday when he practiced with the San Jose Sharks, his hometown team. Morgan was born in San Francisco but spent most of his childhood in San Jose, where he played youth hockey and honed his skills to the point where he earned a roster spot for one season as a teenager with the Regina Pats of the Western Hockey League. "To be out there to skate with my childhood team, and just to be out there with the boys, was an unbelievable feeling," Morgan said. 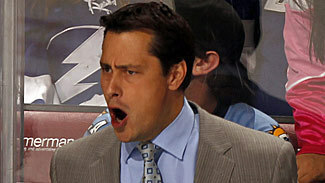 Guy Boucher is steering the Tampa Bay Lightning through some difficult times. The Sharks were 35 minutes into their practice when Morgan came off the bench and took a spot in line as players began taking aim at goalie Thomas Greiss in a shootout drill. Morgan's first shot went wide right, and Greiss stopped his next two. On his final attempt, Morgan put the puck in the net -- an apparent parting gift from Greiss -- and raised his stick in celebration. "He's actually a pretty good skater, believe it or not," Sharks captain Joe Thornton said. "He took a couple of strong strides. Him being an outfielder, I think he can get around pretty good. I'm not sure how sturdy he is on his skates, though. A guy like Dougie Murray, we'll see if he can hit him. We'll see how that part of his game goes. Pretty good, though. I'd give him a B-plus to be honest with you. I was impressed with how good he was." Morgan played seven games for Regina in the 1999-2000 season, scoring two goals and logging 20 penalty minutes. Before that, he had played for some lower-level junior hockey teams in Canada. "I actually had some time [coaching] against Nyjer when he played major junior in Regina," Sharks coach Todd McLellan said. "I was coaching in Swift Current. I know the level of hockey that is played there. For him to ascend to those heights at the junior hockey level, he must have had some talent, some skill. It's a lot like riding a bike -- we're a little bit rusty when we first get on it, a little bit wobbly, but once we go around the block it comes back to you, and you could see him getting better as the day went on." Morgan wore a black Sharks jersey with the No. 2 and the name "Plush" on the back -- his alter ego is "Tony Plush." He said putting on a hockey jersey and taking the ice "brought back so many memories" from his childhood, "just because I love hockey. Not too many African Americans, especially in … San Jose, can actually relate, so I would like to actually encourage people to come out here and try skating. It's a beautiful game. There are so many fun aspects and just ways of meeting people through this game. That's how it's helped me through my life." Morgan's brief stint with Regina marked his final hockey season. After that, he concentrated on baseball, his other sporting love. The Pittsburgh Pirates drafted him in the 33rd round in 2002, and he made his major-league debut with Pittsburgh in September 2007. Last year with the Brewers, he hit .304 and had a series-clinching, walk-off hit in Game 5 of National League Division Series against Arizona. "I moved up there at the age of 16, went up to Canada and played at the highest (junior hockey level) you can get to, went all the way up to Regina and just enjoyed the game. But eventually baseball was my calling," Morgan said. "You reach a crossroads and you know which way to go, and I wanted to get right instead of getting left." While he was still with the Pirates, Morgan skated once with the Penguins, but he said it wasn't the same as skating with his beloved Sharks. "Yeah, skated with the Penguins, but I couldn't really show them my skills like I did here," Morgan said. "I was on the enemy's territory. I bleed teal, so I couldn't really show them all my skills." Morgan said he's been a Sharks fan since their inaugural season in 1991-92 under former coach George Kingston. His all-time favorite Shark is former captain Owen Nolan. After taking part in the shootout drill, Morgan passed the puck with a handful of Sharks, including Ryane Clowe, Joe Pavelski and Torrey Mitchell. On several occasions during practice, Thornton took time to talk to Morgan. "I just joked around with him," Thornton said. "He's a really good guy. He likes to laugh. I was just kind of fooling around with him a little bit. It seems like he enjoyed coming here, and we loved having him. It loosens everybody up. He's got a good personality, and he relates to the guys." Morgan said his style on the ice as a junior hockey player was similar to his feisty approach in the major leagues. "Make it happen. Just excitement," Morgan said. "Exciting player, just like I am on the diamond. Crowd favorite." "His ball characteristics, and the way he stirs things up on the ball field, that's the exact same way he was on the ice surface," McLellan said. "He was a bit of a disturber, got under the skin of some of the other players and competed hard."